Preheat your oven to 325 degrees and line the bottom of an 8 inch baking pan with parchment paper, rubbing the sides of the pan with coconut oil. Set aside. Wash and drain the chickpeas, and then spread them out onto a paper towel. Using another paper towel, dry them off. Then, remove any of the chickpea skins that have come loose. You don't need to remove them all, just as many as have come loose. Re-measure to make sure you have 2/3 of a cup of chickpeas once the skins are removed. Add the chickpeas into a SMALL food processor (mine is 3 cups), along with all of the remaining ingredients for the cookie layer, except for the chocolate chips. Blend until smooth and creaming, stopping the food processor to scrape down the sides as necessary. You want it really creamy! Transfer the mixture to a small bowl and stir in the chocolate chips. 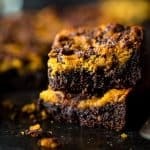 Set aside while you make the brownie layer. Place the peanut butter and agave in a large, microwave-safe bowl and microwave until the peanut butter is smooth and melted, about 2 minutes. Add in the coconut sugar, apple sauce, vanilla and apple cider vinegar and beat with an electric hand mixer until well mixed. Stir in all of the remaining ingredients, and then blend again until totally mixed. Your batter will be pretty thick. Reserve 1/4 of the cup of the brownie batter and then spread the rest evenly into the bottom of the prepared pan. Dollop the cookie dough layer on top of the brownie layer and gently spread it evenly over top, so the brownie layer is totally covered. Drop the reserved brownie layer in small chunks over top of the cookie dough layer. Use a sharp knife to gently spread and swirl the brownie layer into the cookie layer, leaving some of the cookie layer exposed. Bake until the edges are golden brown and begin to pull away from the sides, and a toothpick inserted in the center comes out clean, about 40 minutes. Let cool to room temperature and then refrigerate to cool COMPLETELY, for at least 2 hours. *This measurement is taken before removing some of the chickpea skins, once you remove the skins, you should have exactly 2/3 of a cup of chickpeas.